Home › Home and Kitchen › Ozeri Touch Professional Digital Kitchen Scale (12 Lbs Edition) Tempered Glas.. Combining new advanced touch sensitive buttons, a tempered glass surface, andnew GFX sensors, the Ozeri Touch is one of the industry's most advanceddigital kitchen scales. 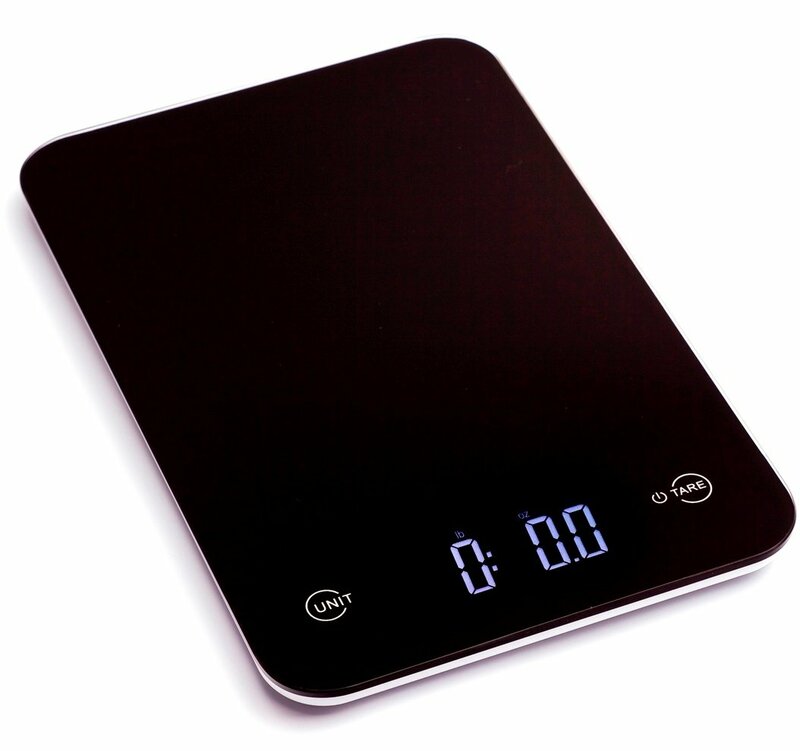 The Ozeri Touch Digital Kitchen Scale features anelegant reflective black surface made out of high quality tempered glass thatis 4 times stronger than normal glass. It includes 4 high precision GFX latestgeneration sensors to deliver superior accuracy and the fastest response timesfor the quick paced chef. The Ozeri Touch Digital Kitchen Scale combines allthis technology into a contemporary thin design and stands out as a show piecefor the modern kitchen. Designed for the culinary perfectionist who desiressuperior accuracy and a showpiece design, the Ozeri Touch is one of thelightest kitchen scales on the market and offers easy portability. The OzeriTouch also features an automatic Tare button that quickly calculates the netweight of your ingredients by subtracting the container weight, whether thecontainer is a bowl, tray, plate or anything else. The Ozeri Touch DigitalKitchen Scale has a capacity range from a mere 0.1 ounces to 12 lbs 10.8 oz,and provides measurements in graduations of 1 g or 0.1 oz on its bright LCDscreen. The scale also displays results in both the US and internationalmetric systems (grams | ounces | pounds | kilograms). The large screenfeatures a new bright LCD with an improved viewing angle for the on-the-movechef, and provides Low Battery and Overload indicators The Ozeri Touch DigitalKitchen Scale comes equipped with 2 Lithium removable batteries for long life,and features a 1 minute automatic turn-off that preserves battery life.